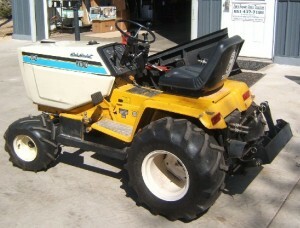 Q: I have a 1620 Cub Cadet. Engines runs fine, but I lose ‘speed’ after 5 minutes of mowing. I can barely nurse it back to the garage. Again, motor is still fine. I figured it was the drive belt slipping. Got a new belt (954-3025), but as I’m installing it, it still seems very lose. Should the belt be very snug? Even the tensioner on it, doesn’t have much of an affect. Actually, I think I found the problem. I am missing a pulley up by the drive pulley. I bought the tractor and it didn’t have it. Just need to find that piece.